Completely finish all non-weather-dependent portions of the flight plan before showing up to the airport. I hadn't finished planning the second leg of the flight due to work commitments, so I got to the airport an hour before the planned lesson time to finish it and preflight the airplane. Didn't happen. 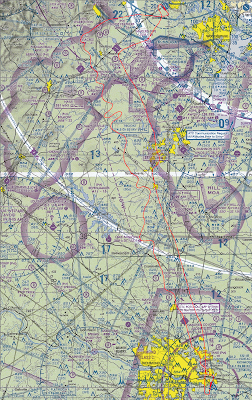 I'm happy that I am learning to do the flight planning with nothing more than a pencil, chart, plotter, and E6B, but I really underestimated how long it would take. I am a perfectionist, and so I went about wasting time trying to pick the perfect checkpoints, etc. I ended up paying the CFI to surf the internet while I finished. Remember to open my VFR (search-and-rescue) flight plan in the air. On the first leg, I completely forgot to do this after getting engrossed in finding the checkpoint in the darkness (those airport beacons can be hard to spot in a lit backdrop). By the time I realized this, there was no point in opening it as we were almost in Richmond Class C airspace. Avoid using DUAT to file VFR flight plans. They don't make the pilot's phone number readily available to Flight Service. More on that later. When opening a VFR flight plan in the air, tell Flight Service the time that you took off even if they don't ask. I made this mistake and I believe that Flight Service used the time as filed (which was just a rough guess). This along with a serious 45-50 knot headwind made us appear overdue and at after 1am EDT, there was no tower open to check with or FBO to confirm anything. I got a phone call just after we landed from a slightly irritated Flight Service rep who couldn't find my phone number without digging (it was in all of my DUAT-filed flight plans, but they don't pass that information on, apparently). He said that they would have initiated a search-and-rescue effort if he couldn't get in touch with me soon. Make small corrections (no more than 20-30 degrees) to intercept a VOR radial. I know better than to fly like that flight log shows (tracking Casanova VOR on the return leg). It is embarrassing to post that. My only excuse is that we were bucking a ridiculous headwind that had increased after I had computed wind correction angles. We were making 50 knots over the ground at one point, since we had to slow down to Va to avoid risking structural damage to the airplane due to the turbulence. The turbulence made it challenging to take any attention away from flying a heading (CFI rated it moderate turbulence). Gain proficiency making landings with a high crosswind. 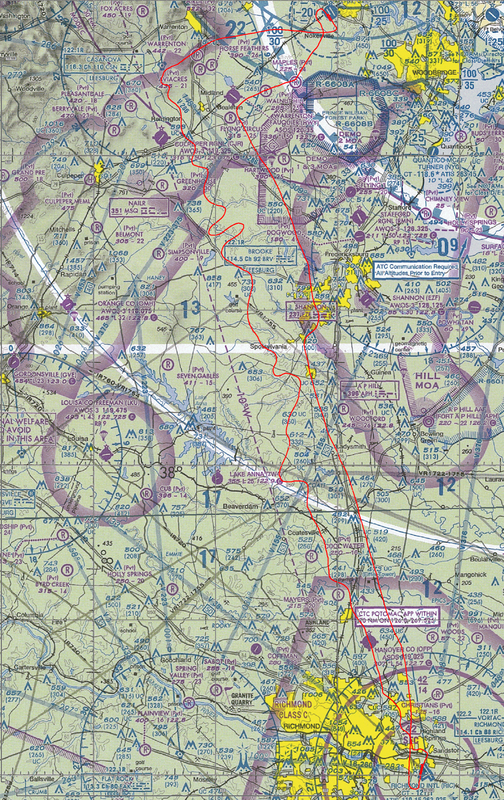 The Dulles TAF had forecast 10 knot winds, but when we returned to Manassas the AWOS reported 14 gusting 32 knots. My skills are not up to handling that, yet. We (well mostly my CFI) landed on the long runway (34R) with no flaps and a pretty significant wing-low crosswind correction when we touched upwind-wheel first. Wild ride. We had a pretty good crosswind on runway 2 at Richmond as well. Keep an airport diagram handy when taxiing around an unfamiliar airport. It is not wise to try to grab an Airport Facility Directory (A/FD) out of a flight bag while taxiing. This flight was good experience. It was cool to fly in Class C airspace where my movements were controlled much more closely. The tower said at one point "VFR descent approved" to allow us to descend to traffic pattern altitude (TPA) from our cruise altitude. I didn't know that I needed permission in Class C airspace. Also, when requesting a temporary frequency change to call Flight Service, the tower gave a time limit of 10 miles to get back on her frequency. I also enjoyed trying to navigate the labyrinth on taxiways using the signage alone, which was interesting to do at night.